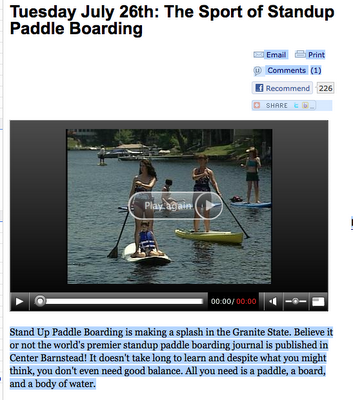 Stand Up Paddle Surfing: Stand Up Paddling in New Hampshire... Check it out! Stand Up Paddling in New Hampshire... Check it out! 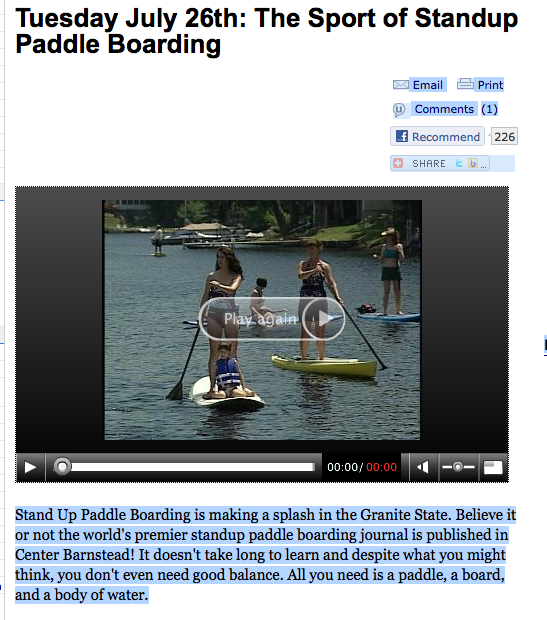 Super stoked to get this link from Clay Feeter over at The Stand Up Journal- check out how stoked they are on stand up paddle in New Hampshire:(click here). The show that aired this has a 25 year run going in New Hampshire... pretty cool that they decided to feature our sport. Clay tells me that after the piece was shot and shown, fifty people showed up for a stand up demo day at a friend's paddle shop- a fully landlocked, inland shop! Watch out paddle world, New Hampshire is coming up!